Goats and sheep together make up the tribe Caprini, from which we get the term caprine. The goat is closely related to the sheep, but differs from it in that the tail is shorter and the hollow horns are long and directed upward, backward, and outward while those of the sheep are spirally twisted. Goats also have beards, unlike sheep, and differ further by the characteristic strong odor bucks (males) give off in the mating season. Goats are far more lively and curious than sheep and make interesting pets. Goats may have been the first hoofed animals that were ever tamed. In the Biblical town of Jericho, people kept tame goats as long ago as 6,000 or 7,000 years before Christ. In the days of early explorers, sailors kept goats on ships to provide milk and meat on long voyages. Dairy goats were brought to North America to supply early settlers with milk. People still raise goats in many places throughout the United States and the world. Different kinds of goats also live in the wild. The earliest goats were animals of steep hills and mountainsides in Asia. Later, they spread to North Africa and southern Europe. The lands they lived in were either hot and dry or cold and barren, with few plants. From these wild ancestors, domestic goats have inherited two unusual traits. They are very surefooted. And they will eat almost any plant material. Goats like grass, leaves, twigs and berries. They will eat bitter desert plants and also lichens. They may nibble dry wood, rope and cotton cloth. When climbing, a wild goat can cling to the tiniest ledges of a cliff that is almost vertically straight. Tame goats will often perform barnyard antics like climbing high walls or playing on a barn roof. Goats have a very good sense of balance and enjoy jumping and climbing games with their herd mates. In the wild state, goats are nomadic and are generally found in mountainous habitats. They are agile animals adept at making long, flying leaps from rock to rock, landing with both front feet close together. Their sure-footedness is due partly to the construction of the hoofs. The shape of the bottom of the hoof is somewhat like a suction-cup. The subunguis (inner layer of material of the hoof) is softer than the unguis (outer layer) and wears away more quickly. Acting as a shock absorber, the subunguis takes the punishment from the pounding that rocky terrain gives the hooves, wears away and keeps the hooves continuously supplied with a hard edge. Goats are gregarious (have a strong herding instinct), except for the old buck, which tends to live by itself and which serves sometimes as sentinel or scout on the outer edges of a herd. The wild goat feeds on greens in pastures; and in the mountains, on the branches and leaves of shrubbery. Most breed in the fall, generally between October and December; although mini-breeds usually can breed year-round. Gestation period is five months or about 145 days; or in some species, a few weeks longer. Two kids are usually produced at birth. Triplet births are not uncommon. Kids stand within minutes of birth, and are able to move with the herd almost immediately. Among the most important of the wild goats is the bezoar goat, or pasang, C. aegagrus, a brownish-gray goat about 91 cm (about 36 inches) high at the shoulder, found from Asia Minor to northeastern India. A number of breeds of goat are raised domestically throughout the world. These animals belong to the species C. hircus, and are probably descended from the bezoar goat. Several million are raised in the U.S. The goat is used for meat, as a milk producer, and as a beast of burden. Domestic goats can be trained to pull carts or serve as pack goats on outdoor adventures. Many parts of the animal are economically valuable for a variety of purposes, such as the skins for leather and the pelts for rugs and robes. One breed of domestic goat, important for its commercial value is the angora. The best angora is covered, except for the face and the legs below the knees, with long, fine, silky hair called mohair. The brilliant, transparent texture of mohair has made it a valued material. The Kashmir or “Cashmere” goat, a small animal native to Kashmir, India, is the source of the fine wool cashmere, from which famed cashmere shawls are made. A goat that produces more milk than is needed for nursing kids is called a milk goat or dairy goat. In the United States, we have six large breeds: Alpine, LaMancha, Nubian, Oberhasli, Toggenburg, and Saanen. Nigerian Dwarf goats are miniature versions of the large dairy goats and are also milked. Goat’s milk compares favorable in nutritive value with cow’s milk and is more easily digested by most people. It is used extensively in the making of cheeses. Alpines, Oberhasli, Saanens, and Toggenburgs are closely related and look somewhat alike. They all originated in the Swiss mountain region known as the Alps, and are referred to as the Swiss Breeds. The Swiss breeds all have upright ears and straight or slightly scooped-out faces (called dished). They may or may not have wattles – two long flaps of skin dangling beneath their chins. The Swiss breeds thrive in cool climates. LaManchas and Nubians originated in warmer climates and are grouped together as tropical or desert breeds and are better suited to warm climates than the Swiss breeds. A popular miniature breed of goat is the African Pygmy. In its country of origin, it traditionally was used as a source of milk and meat, and its skin used for leather. The Rocky Mountain goat of the U.S. is properly a goat antelope and is closely related to the European chamois. Warning: Old Goats Stay Away! goat page for kids on the Internet! and FFA/4-H projects and we will post them here! Hey Kids! 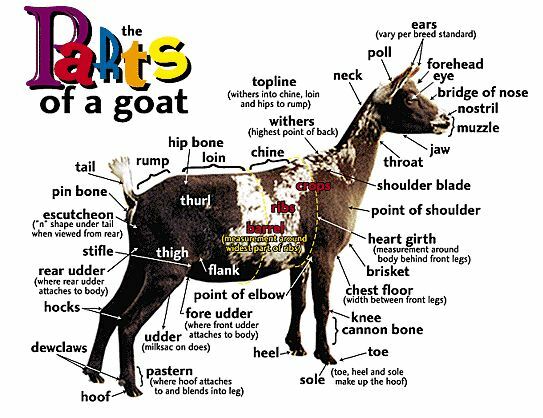 Do You know the parts of your goat? Q: Who is the oldest goat in the world??? Q: Who was the first American LaMancha Goat? There was this farmer walking to his mailbox one day, and he noticed a white hearse coming up the road, and behind the hearse was a man walking with a brown goat, and behind them followed about 20 people. The man with the goat replied that the goat had killed her. Question……Why can’t goats eat round bales of hay??????????? Answer……Cause they are use to 3 square meals a day………. “Why don’t you go to a psychiatrist?” said the second. A traveling salesman (relax, parents, it’s clean … besides, what are you doing reading this page?) arrives in a country store where he finds four men playing poker with a goat. He becomes more amazed when he watches the goat call for two cards, raise his bet, and take in the pot. A man in a movie theater notices what looks like a goat sitting next to him. “Are you a goat?” asked the man, surprised. A policeman in the big city stops a man in a car with a miniature goat in the front seat. The following week, the same policeman sees the same man with the goat again in the front seat, with both of them wearing sunglasses. The policeman pulls him over. Question: What do you call a goat’s beard? Question: How many goats does it take to screw in a light bulb? Answer: Goats can’t change light bulbs! They don’t have opposable thumbs, and even if they did, they wouldn’t be tall enough. ing all Aspiring Goat Illustrators! Include a Self-Addressed, Stamped Envelope (Ask Mom and Dad to tell you what that is if they have figured it out) if you want your artwork returned. The goat has long been a visual aid in symbolic and mythological literature and stories. It has a varied significance: gentleness in one tradition and sensuality in another. Both sexes of the goat symbolize fertility, vitality and ceaseless energy. 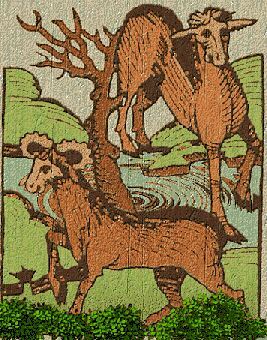 The he-goat (buck) is the epitome of masculine virility and creative energy, while the female (doe) typifies the feminine and generative power and abundance. Symbolically, the goat can be interchanged with the gazelle or the antelope. 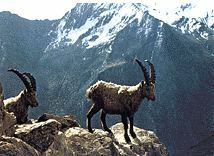 The wild goat of the Old Testament and Arabic lore is the Ibex. The goat was probably, after the dog, the earliest domesticated animal. Goats grazing or at rest, or being milked by a goat-herder, are frequent subjects for idyllic scenes, representing the paradisial state; as such they appear on both pagan and Christian sarcophagi. There have been many strange beliefs and myths about goats. Oppian says they breathe through their horns, while Varro maintains that they breathe through their ears; Pliny expresses a general belief that they are perpetually feverish. Goat skins were used for water and wine bottles when traveling and camping and as parchment for writing. Goat hairs were woven and the animal provided food and milk. The goat, especially the kid, was a sacrificial animal and was used also as a sin-offering (the Scapegoat.) The he-goat is lust personified, and a goat with a human head depicts depravity. The Sumerian god Marduk often has a goat as an accompaniment, and it also appears with hunting goddesses. The wild goat was sacred to Artemis and is an attribute of Dionysos, who took this form when fleeing from Typhon, and of the satyrs, who are half-goats with goats’ horns. Pan also has the legs, horns and beard of a goat. Zeus Dictynnos was suckled by the goat Amalthea, whose skin became the aegis and her horn the cornucopia – she thus represented the protector and preserver, abundance and plenty. The goat was sacrificed to Faunus, who guarded the woods, fields and sheperds of flocks; also to the other nature gods such as Silvanus and Pan. The goat was used as a draft animal and is depicted at such at Pompeii, with Dionysos/Bacchus reclining in a cart deiven by Cupid and drawn by goats. The she-goat was sacrificed to Artemis at her Athenian festival of Munichia. Herodotus says that the goat skin or aegis was worn by the statues of Athene in the Lybrian sacrifices and rites. Goats and dogs were sacrificed at the Roman Lupercalia; the “Lupercal” was naked but for a goat skin and he carried goat-skin thongs for the ritual fertility whipping of women in the crowds who put themselves in his way to receive the fertility-magic. The goat, with the horse and dog, could not be touched by the Roman Priest of Jupiter, the Flamen Dialis. The Semitic goat-god Azazel symbolized life and creative energy. 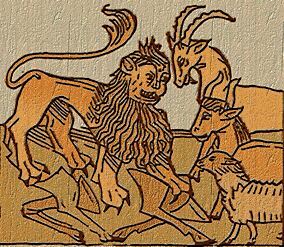 The Hebrew sa’ir, goat, is rendered as satyr in the Old Testament (Isaiah 13: 21 and 34:14) and is an object of worship of false gods (Leviticus 17:7 and II Chronicles 11:15.) The goat also symbolized lewdness. This tradition was carried over into Christianity, where the goat represents the Devil, lust, lubricity and the damned while the sheep sumbolizes the saved. Christ is portrayed as the Scapegoat taking away the sins of the world. But in the Bestiaries, the goat, which climbs the highest peaks and possesses wonderful vision, depicts the highest perfection of searching and the gaze of Christ who sees all, past, present and future. The use of a scapegoat to bear the sins of the entire community is a universal custom, appearing from the rites of ancient Babylon to those of modern-day Japan. The name is derived from the Hebrew ceremonies of the Day of Atonement (Yom Kippur,) when a goat was used to carry away the sins of the people into the wilderness, thus freeing them from the consequences. The scapegoat is delegated guilt and escape from the consequences of sin. The Hebrew Scapegoat was chosen from two goats, one of which was for the Lord. The other, the sin-bearer, was sent into the wilderness for Azazel (Leviticus 16:7-10.) In Christianity, the scapegoat is used as symbolic of Christ suffering for and bearing the sins of the world. The Nubian Ibex is the wild goat of the Bible and a clean animal for the Hebrews. It is an Arabic symbol of beauty: “more beautiful than a wild goat.” Ibex horns are a frequent motif of Mesopotamian art and in the northern steppes of Asia. Pliny remarks on the great speed of the ibex and says that it hurls itself from heights and lands on its horns, which are elastic and can take the shock, thus it can bounce. Arabic lore associates the stately march of the he-goat leading the herd with dignity of manner and bearing; but as contrasted with the meek sheep, it also symbolizes lawlessness, independence and straying. It is a sacrificial animal. The ram and he-goat are attributes of the Vedic Agni, god of fire and creative heat, who rides a he-goat. Thor, Scandinavian god of thunder and fertility, has a chariot drawn by goats who are sacred to him; his goat Heidrun supplied the heavenly mead, the drink of the gods. In European literature and folklore, the goat often represented the determined, stubborn side of mankind.